This week, CNN launched New Day, a three-hour morning program at the center of the channel’s effort to regain its footing in the world of cable news. To do that, it will have to compete not only with the major networks, but also with more popular shows on Fox News Channel and MSNBC. This is the most high-profile change so far by Jeff Zucker, the new head of CNN Worldwide, who said he wants New Day to set “the tone and the agenda for the day and for the entire network.” The new program, which Washington Post’s Paul Farhi wrote “may be key to CNN’s revival,” follows a well-documented slide at the channel responsible for creating the 24/7 cable news model. The shift at CNN comes amid signs that there might be a ceiling for audience growth in the cable news sector. Viewership bumped up slightly during 2012, but did not receive the normal election year boost and remains below the high point hit in 2009. Financial growth also has tapered off. (Read more in the 2013 State of the News Media report). Though ratings have improved in recent months, CNN’s morning programming ranked third in viewership in 2012, averaging just 239,000 viewers per day, compared with 452,000 for MSNBC’s Morning Joe and 1.13 million for Fox’s Fox and Friends, according to Nielsen Media Research. Other parts of the day look no better. Continued declines in prime-time viewership, considered the most critical time for cable news, placed the channel third behind Fox and MSNBC for three years straight. In 2012, it fell to third place in daytime viewership for the first time. Last year also brought signs that audience declines would begin to affect revenues. CNN was estimated to experience a dip in advertising income, while its two competitors expected to see gains, according to data from SNL Kagan. There’s more to the story, of course. CNN remains a highly profitable organization, with a wide digital reach and a sizable international presence; it operates more bureaus around the world than Fox and MSNBC combined. And in May, the channel’s previous morning show, Starting Point, averaged 380,000 viewers, according to Nielsen—not enough to come close to Fox and Friends’ 1.26 million, but enough to approach MSNBC’s Morning Joe, which drew an average of 387,000. But the broader pattern of ratings decline—particularly in the crucial evening hours—was a key reason former NBCUniversal chief Zucker took over in January. Years ago, both Fox and MSNBC carved out distinct identities in their prime-time programming and ended up with viewership that surpassed CNN’s. Those two channels have now done the same with their morning shows. Viewership figures for New Day’s Monday debut suggest the battle won’t be easy. The show had 247,000 viewers from 6 a.m. to 9 a.m.—a third place finish. 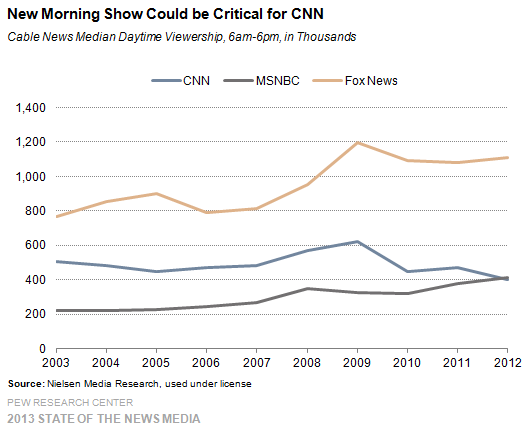 Correction: This post was updated to reflect more comparable Nielsen viewership data for the cable news morning programs (6 a.m.-9 a.m.). The original post contained data representing the 6 a.m.-9 a.m. period for Fox News and MSNBC, but the 7 a.m.-9 a.m. period for CNN.